Many of us would love to improve our appearance, but don’t have either the time or the desire to undergo cosmetic surgery. With today’s advancements, there are things that we can do to make amazing changes without surgery or a long recovery period. Thanks to a new FDA-approved drug, dynamic lines can be dramatically softened. BOTOX treatments can be used to improve the appearance of worry lines, frown lines, laugh lines, crow’s feet, and other wrinkles caused by aging. BOTOX injections are one of the most popular cosmetic treatments today. This procedure can be done on a lunch break and requires no anesthesia or recovery. Overall, the vast majority of patients love this ” quick fix” and return for a BOTOX treatment boost as soon as the wrinkles begin to reappear! BOTOX is the trade name of Botulinum Toxin Type A, a purified neurotoxin complex manufactured by Allergan. In large amounts, this toxin blocks the nerve impulses to muscles, causing a form of paralysis to each muscle group. Although it is a toxin, BOTOX has been used safely by ophthalmologists for over 10 years. It has been used for wrinkle therapy since the early 1990’s with no serious side effects. In fact people with migraine or chronic headache pain often find relief of their symptoms after BOTOX therapy. This naturally formed substance (BOTOX) is injected into the muscle that is contracting abnormally. Be assured that BOTOX therapy is safe. It has been tested and used for aesthetic purposes for many years and is an especially popular treatment for visible signs of aging. By using extremely small doses of BOTOX, injected directly into a specific muscle, only the action of that muscle will be paralyzed. Therefore, the problem that muscle causes will be stopped, leaving your skin smooth and relaxed. After the treatment, the overlying skin remains smooth and unwrinkled while the untreated facial muscles contract in a normal fashion. Some of the most common areas treated include crow’s feet, frown lines, laugh lines, and forehead wrinkles. BOTOX injections are best on the upper third of the face. Forehead lines, furrows between the eyebrows, and lines around the eyes (“crow’s feet”) respond favorably to the treatment. Frown lines ( below the mouth ) and chin creases may also be improved with a BOTOX injection, but response here varies among individuals. Please visit our office for a personal consultation on how BOTOX treatments can help you. If you would like to learn more about what BOTOX treatments can do for you, simply call our office for a personal consultation. Dr. Barnes is experienced in BOTOX injections and will be able to tell you if the treatments will work for you. The actual BOTOX treatment takes only a few minutes and takes effect in 3-4 days.Gradually over 3-5 months the effects of the treatment will fade, and the muscle action will return. 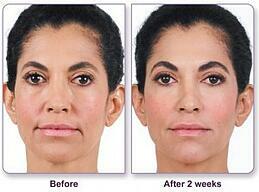 When expression lines start to reappear, a simple repeat treatment will maintain the desired result. Are there any side effects? The side effects of BOTOX injections are typically related to the area where the solution is injected. There may be a slight discomfort from the needle entering the skin, and a small chance of a bruise at the site of the injection. There are no reports currently of damage to the eye, with injections to the eyelid. There have been no permanent treatment side effects. In fact, BOTOX treatments have recently been awarded approval for cosmetic use by the (FDA) Food And Drug Administration. Is there anything I should avoid doing following my treatment It is best if you do not manipulate the treated area. Massaging the area may increase the likelihood of BOTOX migrating to areas of undesirable effectiveness. Also we have found that repetitive and intermittent contraction of the treated area for the immediate 4-6 hours following the procedure can improve the result. Can I exercise following the treatment It is in your best interest to refrain from heavy exercise, bending over or laying down for the next 4-6 hours following the procedure. Theoretically, these maneuvers allow the Botox to migrate to an undesirable area. What if I get a bruise Bruising is rare but it is a possibility. Those who are on aspirin, aspirin containing products, high doses of Vitamin E, natural alternatives such as Ginger, Ginko Boboli, Ginseng and Garlic may increase the likelihood of a bruise occurring. If you do develop a bruise it will resolve like any other bruise you have experienced in the past over the next week. Cover-up makeup may be helpful to you. But no not be overly concerned the wrinkle reducing benefits of your Botox will far outlast your bruise. What if I experience a headache This is a very common occurrence. As a matter of fact Botox is now being used to treat people with headaches. However, if you do experience a headache your usual methods to treat a headache should suffice. We recommend you stay away from aspirin or aspirin containing products. Motrin, Tylenol, cool compresses and dimmed lights are all traditional methods of relieving headache pain. Can I apply make-up to the treated area We recommend you wait 6-12 hours after your treatment before applying your make-up. If you must apply it earlier gently clean the area and gingerly apply the make-up. A gentle make-up that is designed for those with sensitive skin is better suited for the recently treated area. Can Botox get into my eyelid Botox migrating to an undesirable location is highly unlikely although its occurrence has been reported. If Botox were to get into the eyelid you could experience a difference in position between the two eyelids. This occurrence is highly unlikely, but if you feel as though your eyelids are asymmetric let us know. We can prescribe eye drops, which will improve the discrepancy between your eyelids. Also you need not worry, the asymmetry usually rapidly resolves over a 2-6 week period of time and it is not permanent. When will I see the resultsGenerally, most people start to recognize the benefits in 3-5 days following treatment. You will not necessarily feel anything different but you will notice a decrease in the wrinkles at the treated areas. If you do not see the desired result be patient as some people may take up to 2 weeks to see the improvement. How long will the results last Although you may wish the wrinkle free look to last indefinitely, it is not permanent. Approximately, three months after the treatment most people start to see their wrinkles return. In some individuals the benefits may last up to 6 months and in a few the wrinkles may start to return as soon as two months. Mounting evidence suggests that the effectiveness of the Botox lasts longer with successive new treatments. We hope you enjoy the benefits of your Botox treatment and it is our pleasure to help you reach your goals. As always if you have any concerns, please do not hesitate to call us at anytime. In the human body, large amounts of hyaluronic acid are found between the cells of our skin and the tissue underneath the skin. In our youth, this high amount of hyaluronic acid provided our skin with its youthful fullness, supple appearance and moisture. Unfortunately, our bodies’ own natural levels of hyaluronic acid decrease with age. Along with other factors like smoking, dehydration and stress, this decrease in hyaluronic acid gives us a tired and deflated look, just like when a balloon loses its volume and therefore its shape. Dermal fillers such as Juvederm and Restylane help restore this lost volume, giving us back our youthful look. 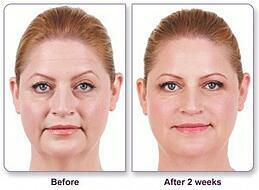 Juvederm and Restylane are FDA-approved, hyaluronic acid-based dermal fillers. Hyaluronic acid is a sugar found naturally in human skin, so the risk of allergic reaction to these products is extremely rare. Because hyaluronic acid binds water (in the way a sponge absorbs water), it acts as an inflating cushion to the skin to support facial structures and contours that have lost volume. What areas can fillers help? Fillers like Juvederm and Restylane are frequently used to add volume to the nasolabial folds (lines around the nose), marionette lines (corners of the mouth and chin), tear troughs (bags under the eyes) and lips. They can also be used to fill in depressions from deep wrinkles or even scars. In addition to acting as a cushion, the hyaluronic acid in these fillers also brings water to the surface of the skin, causing your complexion to look fresher and more supple. If you would like to learn more about what dermal filler treatments could do for you, simply call our office for a personal consultation. Dr. Barnes is highly experienced with their use and will be able to tell you if the treatments will work for you. How long will it take to look better and how long will the effects last? After numbing your skin with a topical anesthetic, Dr. Barnes will inject the fillers under the skin in the trouble spots, instantly smoothing out the wrinkles and folds on your face. You’ll see the difference immediately! 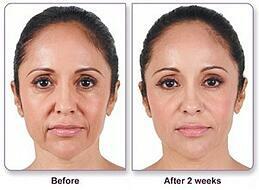 The filler will gradually be reabsorbed by the body over 6-12 months.